While I've seen Shaun of the Dead before, I have never seen Hot Fuzz. But from Shaun to Mission Impossible to Star Trek, I've always been a fan of Simon Pegg. So when they announced this third movie to Director Edgar Wright's Three Flavours Cornetto trilogy, I was more than excited. 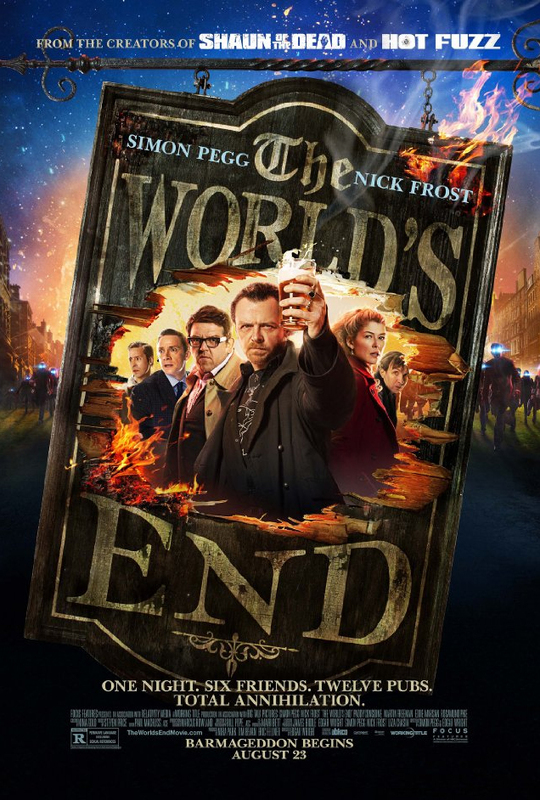 The World's End while it may not be Simon's finest performance brings you such hilarious scenarios and jokes with its ridiculous plot will have you laughing until the very end. The premise is five teenage friends in a small town attempted to complete the Golden Mile. Visiting pubs along a stretch and having a pint in each one. They never finished their pub crawl, which fast forwards us to the future. 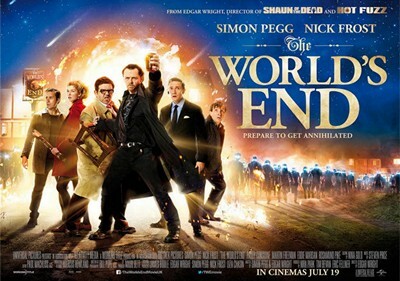 The leader of the group was Gary King who as an adult is played by Simon Pegg. He tells his tale as a teenager and his friends while at an Alcoholic Anonymous meeting or something similar. You can say tell he's really downtrodden compared to his other four friends who have become successful businessmen or salesmen. So when Gary goes around to his four friends, all of which he hasn't seen for years and proposes to them that they reattempt the Golden Mile, they are more than reluctant Only with some twisting and some white lies does he convinces them to return to their hometown and make a go at it. When they return they see that not everything is as it seems. I do not want to reveal too much, but I have to say I was really surprise at the fight choreography. The fast and furious pace reminds me more of a martial arts film then a sci fi comedy. I love Nick Frost in the movie. He plays Gary's best friend or "wing man", Andy Knightley who outshines his trilogy partner Simon here. My favorite scene though would have to be when Simon's character Gary is trying to finish his pint but keep getting interrupted towards the end. The special effects in the film are also worth nothing. I especially like the explosion toward the end. With regards to the Cornetto, which gives us the name Three Flavours Cornetto. Look for it passing by Nick's character as he is pressed against the fence towards the end. Overall, I would recommend watching the film. If you enjoy their other films, you'll definitely enjoy this one. Because of the foul language and sexual references I would not recommend bringing a young teenager or child. The story is a bit far fetch, yes, but that's part of the enjoyment with their films. You can also say that the story is a bit predictable but I found the end to be quite satisfying and quite far from what you would expect. The end of the world has never been so funny this summer.